Maple Holistics Evening Primrose Oil is pure cold pressed evening primrose essential oil and is exactly why you need for the skin you so desperately crave. Primrose oil is full of Omega-3 and Omega-6 Fatty Acids that help nourish your skin for a radiant appearance. Their oil is 100% pure with no fillers or additives. The primrose's rejuvenating power will leave your skin noticeably softer and your hair will be incredibly stronger. Evening Primrose oil is great for anti-aging properties in skincare, it actually helps to smooth the skin. Evening Primrose Essential Oil can help fight signs of aging by moisturizing the skin, and by reducing the damage caused by oxidizing tissue (via free-radical elimination). This helps create smoother skin and reduces fine lines, wrinkles, and dark circles around the eyes. It soothes itching associated with eczema and psoriasis inflammation. Evening Primrose Oil contains essential fatty acids that lock in moisture to hydrate dry patches and relieve itching/inflammation. It also has anti-inflammatory properties that allow it to assist the regeneration of damaged or aged skin cells, which is especially helpful for those suffering from eczema or psoriasis. Thus it helps get rid of the dry patches much quicker than if nothing was used. Evening Primrose Oil contains high concentrations of gamma linolenic acid (GLA) which help moisturize the skin and treat various skin conditions. As mentioned earlier, it promotes hair strength. The Omega-6 fatty acids nourish the hair and can help improve hair texture as as well as strengthen the roots and shafts of the hair, making them less prone to breakage. It also helps modulate physiologic skin processes which can reduce inflammation and dryness. Our cold-press extraction methods ensure these benefits remain intact. Personally, I loved the way it helped make my skin look more radiant. It was noticeable, even when wearing foundation. My skin just looked smoother and younger. It was also hydrated well and felt more moisturized. My hair did feel stronger and was prone to less breakage. I don't have eczema or psoriasis so I cannot report back on anything pertaining to that. But I did let my daughter use it. She has dermatitis from washing her hands too much. I added drops of the Evening Primrose Oil to her hand cream. It helped with some of the redness and raw skin that she had. So it is definitely an anti-inflammatory. 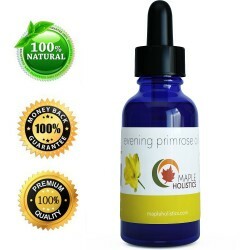 Maple Holistics Evening Primrose Oil is available through www.mapleholistics.com.